Saturday, July 7, 10:15 a.m. -12:15 p.m. Though this country prides itself on principles of democracy and justice for all, in actuality the U.S. was founded on the practices of genocide and slavery. 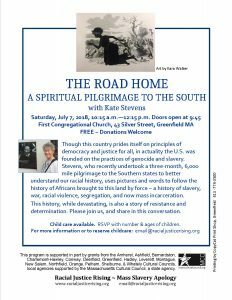 Stevens, who recently undertook a three-month, 6,000 mile pilgrimage to the Southern states to better understand our racial history, uses pictures and words to follow the history of Africans brought to this land by force – a history of slavery, war, racial violence, segregation, and now mass incarceration. This history, while devastating, is also a story of resistance and determination. Please join us, and share in this conversation. Saturday June 30, nationally: Families Belong Together protests.